The first thing you need to know about Spivey, Kansas is that a web search for "a history of Spivey, Kansas" reveals only a brief one. 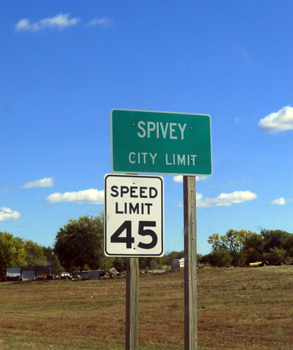 This is because there could only be a brief history of Spivey, Kansas. Even though it has managed to hang on for almost 130 years, Spivey's have been a rather uneventful 130 years, a fact not lost on its 78 residents, and a fact no doubt cherished by those residents in their own, quiet, prairie way. 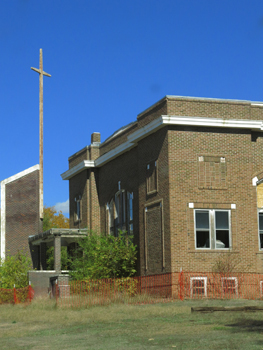 Aside from a recent uptick from the resurgence of domestic oil, the last few decades have seen the same slow shrinkage of Spivey as has afflicted just about all other small, Kansas towns. Modern, mechanized agriculture requires steadily fewer people, and the bigger towns and cities look like backdrops at least more interesting to the young, even if they offer no actual solutions to youth's privations. The myriad shades of red and brown that surround the town in late summer, the slowly rolling land garnished by green splashes of trees along creeks and ponds, all gave an idyllic undertone to the low-level terror that befell the town as the 20th annual Postmodern Village Conference descended like a liberal plague. This year's conference was the first test of the capacities and capabilities of Purewater University's new convention and retreat center that now takes up most of what was once a wheat field comprising the entire north side of town. In comportment with Purewater president Jean Bordeaux's expansionist "Vision 2020" strategic plan, Spivey's decline was seen as an opportunity. Located some 50 miles from the main campus, Spivey's inexpensive and available real estate, remote location, and nearness to good hunting ground was viewed as coinciding quite well with the business plan part of Purewater's strategy, which includes the need to create facilities "catering to the needs and expectations of thought-leaders in industry and finance and private-sector innovators and agents of change." Apparently, this takes approximately $50 million in high-tech meeting space and parking for 5000. Being the prudent people they are, the university's Administrative Council decided that the initial event, "a chance to get the bugs worked out," would be our humble conference, impoverished English majors and cultural critics deemed a bit more expendable guinea pigs than would be the fat cats for which the center was designed. Sadly, we weren't much help: having meeting space that doesn't leak anything or smell strange was impressive to us, and our big concern was not where to bag some prize turkeys but where to get a vegan meal in beef country. As it turned out, all worked as promised, but that didn't stop us from complaining about the rising cost of tuition in comparison to our stagnating salaries and the shrinking availability of tenure-track positions.